Don’t miss a moment of your favorite season! 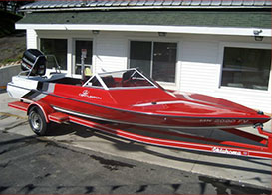 Have your boat ready for the open water this spring! 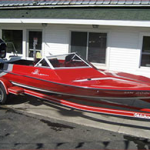 We perform fiberglass repair, metal flake repair, and aluminum boat repair for collision, structural, and storm damaged boats. 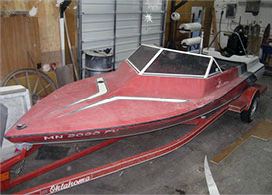 It is common for customers to store their boats all winter long and then in the spring find things that they meant to have done, ending up having their boat in the repair shop during prime fishing and boating seasons. So remember to call and schedule to get your boat repaired or refurbished now! 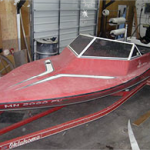 If your fiberglass, aluminum or metal flake boat has been damaged due to collision, dock, rock, wind, storm, trailer, or whatever – the professional craftsman at Anchor Marine Repair can restore it to pristine condition. If you have insurance we will work directly with the insurance company and spare you the red tape. A complete restoration with new wood transom and floor. Show room paint job to original style and color. We are happy to offer pick-up and delivery service from your home, dock or marina within 250 miles of the Minneapolis/St. Paul area.